There will be critics. There always are when Donald Trump puts his name to something. 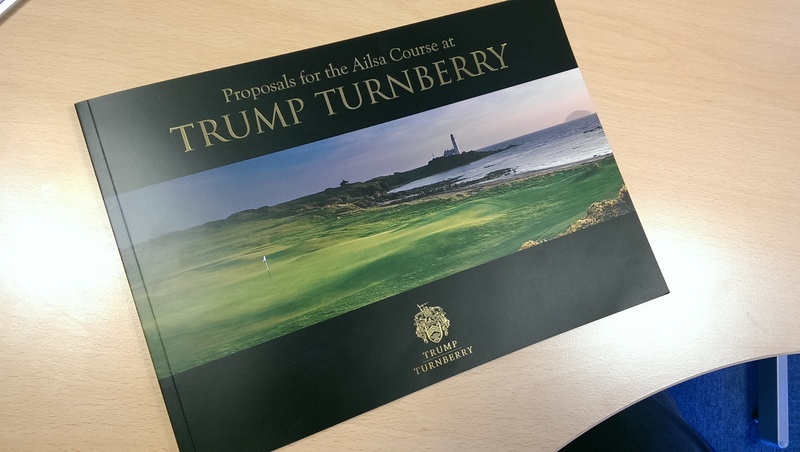 However, there can be no doubt that the changes proposed to the Ailsa Course at Trump Turnberry – outlined in full yesterday by the American tycoon’s son Eric and course designer Martin Ebert – are not just advisable. They’re essential to maximising the untapped potential of this magnificent stretch of land. We’ll get to the finer details in a moment but, first, a word for the critics. There has been some idle chatter that it is in some way sacrilegious to change the existing layout. People with that attitude really should swot up on their history. The Ailsa Course has been changed numerous times before now. Take a look at pictures of the original course, as laid out by Willie Fernie in 1901, and tell me that it is the same as it is now. The present ninth? That was the sixth. The first, meanwhile, took a route down towards the beach from the right of the path behind the existing first tee and the left of the current 18th. What Trump is doing is evolution, not revolution. There is also a feeling amongst some that Trump will ‘ruin’ the course. That’s a baseless argument. The Trump Organisation has a well-earned reputation for taking struggling resorts and turning around their fortunes. Just look at how Doral, home of the WGC-Cadillac Championship, has improved since they took over. The changes made there – particularly those done to the Blue Monster course with top course designer Gil Hanse – have received almost universal praise. That should allay anybody’s worries, as should the fact that Trump is a proven golf course and real estate developer. This isn’t some ‘angel investor’ coming in, with no knowledge of golf, hoping to bluff their way through a redevelopment on the weight of their wallet. Trump gets golf. Donald Trump and his team are pitching this as the rebirth of the Ailsa Course. And so to the changes, which have been outlined in a specially-produced brochure, below. Much of the focus will fall on the plans for the ninth, tenth and eleventh holes, which are being almost completely redone. Rightly so, too. At present, they are the three weakest holes on the course. The ninth is terrible, the tenth is average at best, and the eleventh? Perhaps the worst hole on the Open rota. Seriously. What makes all of this worse is that they occupy perhaps the most iconic part of the whole resort, wrapping around the famous lighthouse. What Trump has proposed – turning the ninth in to a dramatic par-3, making the tenth a sharp dogleg par-5 around the rocks, and creating a completely new par-3 at the 11th, which brings the coastline more into play – will greatly enhance not just the challenge of this stretch but also the experience of playing it. And if that doesn’t, then the use of the lighthouse as a new halfway house definitely will. I’m also excited by the redesign of the par-3 sixth. I really don’t like the current hole. It’s long and charmless. By shortening it from 222 yards from the whites to 150, and completely redoing the green, it will be a far more interesting prospect. Not easier, necessarily, but definitely better. As for 18, the view from that new back tee, positioned way back in the dunes behind the sixth tees, will be quite something. Trump and his team are pitching this project as the rebirth of the Ailsa. It’s certainly looking that way. Best of all, we don’t have long to wait to sample these changes for ourselves. The new and improved course will open for play in June next year. Don’t know about you but I can’t wait. What do you make of the changes Donald Trump has outlined for the Ailsa Course at Turnberry? Leave your thoughts in our 'Comments' section below.